Showy Rosary Pea is a climbing liana with stem slender, sparsely yellow hairy. Leaves are pinnate, alternate. 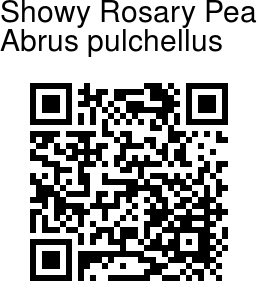 Leaflets are 6-10-paired, op­posite. Leaflet-stalks are short, blades oblong, or obovate-oblong, 0.5-3 x 0.3-1 cm, membranous, sparsely white bristly or densely white hairy below, hairless or hairy above, rounded or heart-shaped at base, flat and with mucro at the tip. Flower racemes are borne in leaf axils, 3-10 cm long. Flowers are dense, 3-9 mm. Sepal cup is bell-shaped, 4-toothed, white bristly or densely gray hairy. Flowers are pink, purple, or purple-red. Stamens are 9. Seed-pods is ob­long, 5-6.5 x 0.8-1.5 cm, densely white hairy, splitting open with 4-12 seeds. Seeds are black-brown or black, lustrous to slightly lustrous, elliptic or ovoid, compressed. 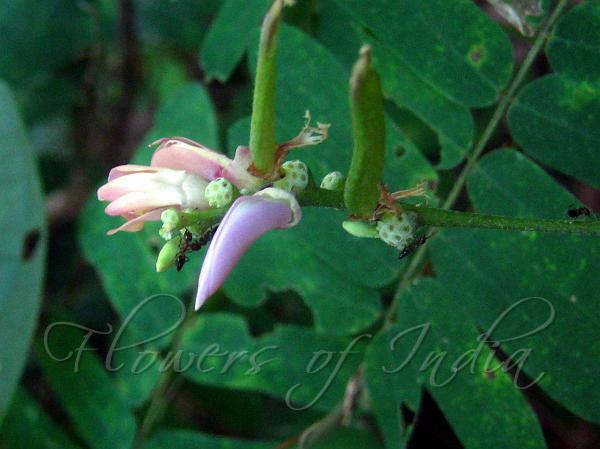 Showy Rosary Pea is found in tropical Himalayas, India, Ceylon, SE Asia and China, at altitudes of 200-1300 m.